My daughter tends to have trouble with falling asleep at night. I pondered upon what she would be, when in popped my head the idea of a “night-owl!” It was perfect since she totally is my little night owl. My mother and I went to Michaels and had a blast. We bought 3 different colors of felt, hot glue, foam, pipe cleaner, stencils, fishing wire and scissors. We cut out 185 feathers out of the 3 different colors of felt. We then hot glued them to my daughter’s brown sweatsuit in horizontal and vertical positions. We cut out circles of felt for the eyes, and made a smaller feather for the beak and hot glued that as well. We hot glued a piece of pipe cleaner to the top of her hood, attached a halo (also out of pipe cleaner) to the existing pipe cleaner. We then cut out shapes of a bat, a moon and a star using our stencils to help. We poked a small hole through each shape and pulled the fishing wire through. We then strung each shape onto the halo. WA LA! 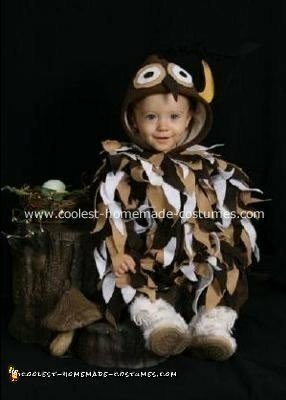 She became a “night-owl” Her Owl Halloween costume was adorable! We also went as far as to turning her wagon into a nest. We used a large wicker basket, cut it in two and attached it on both sides. We bought fall leaves, and other items that looked like parts of a nest and just weaved it in and out of the baskets. It was a total hit for all the halloween events we went to. Unfortunately, I don’t have a great picture of that. But it was a ton of fun creating this costume, and I can’t wait to think up of things to do next year! So cute with the hood!